We feel proud to introduce ourselves as one of the well-known manufacturers and suppliers of Cylindrical Grinding Machines. 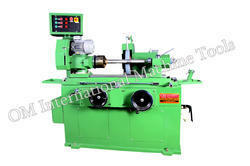 The offered cylindrical grinding machines are largely used for producing the smooth finish on flat surfaces. Our supplied cylindrical grinding machines are provided with a machining wheel which cuts the chips from a work piece, to make it smooth. We are offering wide range of Grinding Machine for industrial use which can be supplied even as Turnkey basis. - Casting are stress relieved by "formula 12" and in normalised oven. - Tall stock, wheel & work spindle are heat and treated to achieve dimensional stablity. - Assembly of precision bearing woth in dust free environment. - Tall stock spindle acting in close tolerence & super finish bore. - All rotating part are dynamically balanced. In addition our products are duly seasoned, rigid and strong enough to prevent any sort of distortion & wear. Cylindrical grinding is a process used to finish grind the outside or inside diameter of a cylindrical part. Cylindrical Grinding, Surface grinding , Hydraulic Press, Milling etc. CIRCULAR GRINDING MACHINE HELPS IN POLISHING THE CIRCULAR AREA LIKE SPANNER. HELPS IN ROTATING AND GRINDING THE PRODUCT UPTO 270 DEGREE. We offers universal hydraulic grinding machines manufactured using superior quality, latest design, proper material selection. We are offering universal cylindrical grinding hydraulic machine which is highly rigid and capable of bearing heavier loads. We are a leader in offering a best quality of Cylindrical Grinding Machines to our clients. 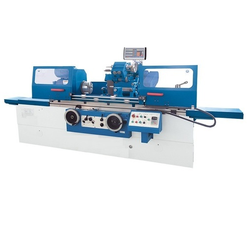 The Cylindrical Grinding Machines are highly recognized in the market as compared to other ordinary machines due to its high efficiency, optimum performance and longer life span.